PYD (Democratic Union Party) president Salih Muslim confirmed that they will attend the Geneva II Middle East peace conference. Muslim underlined that the PYD will go to Geneva with its own proposals and added the conference could be a first step towards reaching some agreement on a solution to end a conflict which, he said, could last for a long time still. The Geneva II is a proposed United Nations (UN) backed peace conference that would take place in Geneva in late 2013 with the aim of stopping the Syrian civil war and organising a transition period and post-war reconstruction. YPG forces have forced the ISIS to compromise and back off, something even the the most advanced powers can barely handle on their own. A number of the Free Army leaders in Halab are working to reach an agreement between the Islamic State of Iraq and Al-Sham (ISIS) and the People's Protection Units (YPG) to stop the fight between the 2 sides in Jndress area in Afreen and Atema town in Adleb Province. According to the agreement, the ISIS fighters will withdraw from the hills between Atema and Jindress and will give them to the battalions of the Free Army, while the YPG forces will retreat to the Kurdish areas surrounding Jindress, a YPG negotiator told PUKmedia. HZKurdi wrote: YPG forces have forced the ISIS to compromise and back off, something even the the most advanced powers can barely handle on their own. Last edited by Shirko on Wed Oct 09, 2013 1:03 am, edited 1 time in total. The name sounds like he is Egyptian! Somebody should tell them where that eagle on their flag came from! And are Saudis funding them? We better start getting some answers! Or our list of enemies is going to start growing, and they will be the sore losers in the end. Reports confirmed last night that one of the Islamic State of Iraq and Levant (ISIL) commanders, Ebû Umet Elah El-Mesrî has been killed in the clashes between YPG (People's Defense Units) and the al-Qaeda linked group in Ezaz (Aleppo). Clashes between YPG Forces and (ISIL) gangs continue in some regions of Qestel Cindo of Efrîn, according to local sources. Last edited by Shirko on Thu Oct 10, 2013 11:41 am, edited 1 time in total. The son of PYD co-chair Salih Müslim, Şervan, has lost his life today following clashes in Til Ebyad, Rojava. According to information received clashes erupted today at around 5.30pm local time in Til Ebyad, some 15 km from the city of Kobani. 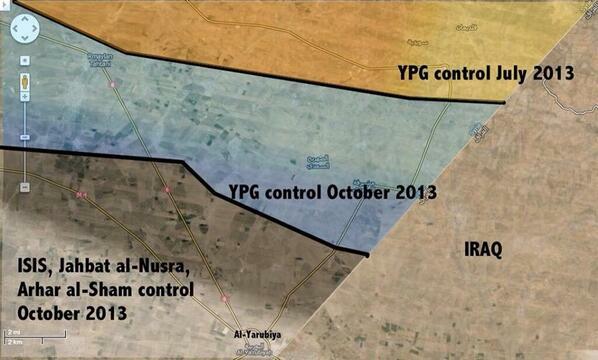 YPG (People'Defense Units) clashed with militants from al-Qaeda linked State of Iraq and Levant. Şervan Müslim lost his life in the clasges. His body was taken to Kobani tonight at around 8pm local time, where he was met by hundreds of people. His mother Ayşe Efendi was also there to meet her son. Şervan Muslim will be buried tomorrow at 11am local time in the Martyrs Graveyard. HZKurdi wrote: May rest in peace. I wish I was infront of him to shield him. I feel the same way brother. Great up to date symmetry of the situation. The 50 million Kurds live on their ancestral land Kurdistan for more than 5000 years. The Kurdish nation has been occupied and divided between four countries by the victories allies after the World War I. This criminal unjust action created a historical tragedy for the Kurdish people. The countries of Turkey, Iran, Syria and Iraq cooperated and used forced cultural assimilation, forced emigration, massacres and genocide in the last 90 years to assimilate and eliminate the Kurdish nation, but failed to accomplish their colonial aims. After 1923, Lausanne treaty between the Turkish state and the Allies, France annexed part of Kurdistan to Syria. Western Kurdistan located in Northern Syria, it includes Al Haska, Qamishli, Kobani (Ain Alarab), Afrin and northern area of Aleppo (Shaikh Maqsood and Ashrafia), the area of Al Bab, Manbaj and Ezaz north of Aleppo city. There are Kurds live in Jabal Al Akrad, Damascus, Hama, Latikia and other Syrian cities. The Kurdish population is estimated at 4 million or about 16% of the Syrian population of 23 million. Because of the historical and geopolitical situation of the Kurds in Syria, they concentrated their struggle on political peaceful activities and helping other parts of Kurdistan in their struggle for democracy and liberation. The consecutive Syrian governments particularly the Bath Baath party established a strategic plan in 1962, to assimilate and Arabize the Kurds by force, violating all international laws protecting minorities and human rights. Some of these policies are: the Arab belt in which hundred thousand Kurds have been evicted from their land and replaced by Arabs. In 1962 under the decree 93, the government suspended the citizenship from 120,000 Kurds. The Baath kept the Kurdish area poor backward and unable to support its population and forced the Kurds to emigrate out of Kurdistan. They used forced national and cultural assimilation policies to destroy the Kurdish culture,www.ekurd.net the Kurdish identity and prohibited the use of Kurdish language. The Baath regime tried to subdue the Kurdish nation by using fascist policies of arrest, torture, discrimination, terror and massacre against the Kurdish movement and resistance. The Kurds resisted all of these unjust criminal policies, by staging peaceful disobedient resistance. The Syrian government killed and jailed thousands of activists and innocent civilians. In 2004, the Kurds staged a big revolt. The security forces suppressed that revolt with excessive military force in which hundreds of Kurds were killed and thousands imprisoned. living on a large area of 77,000 sq. miles. The Alawi with an alliance with the Baath party, Sunni business class and Christians controlled the Syrian government and its policy for the last 52 years, since 1961. The Kurds were treated like enemies and second-degree citizens. The current situation: On the international and regional level, the USA, Europe, Turkey, Saudi Arabia, Qater, Jordan, Gulf states, Libya, Tunisia, FSA, Syrian coalition, Muslim Brotherhood and Jihadist movements associated with Al Qaeda (like Jabhat Al Nassra, The Islamic State of Iraq and Al Sham) give their support to the Syrian opposition who are fighting to overthrow the Syrian regime of Bashar Al Assad, on one side. On the other side: Russia, China, Venezuela, Syrian Government, Iraq, Iran, Hezb Allah in Lebanon, many other countries and Shea forces are in support of Syria. Locally, the Syrian army consists of 300,00 solders + 100,000 National Guards, plus a few hundred thousands of Alawi, Shabiha, Baath party members, Hezb Allah, police and secret services. On the other side, the Syrian opposition consists of 60,000 to 80,000 fighters (thousands of them are Jihadist from other countries). The National Coalition of Syrian Revolution and Opposition Forces led by many groups including the Muslim Brotherhood, SNC and supported by Qater, Saudi Arabia and Turkey is the political organization for FSA and the supreme military council. This National Coalition is led by Ahmed Al-Jabra and its newly established government is led by Ahmed Touma, and the Supreme Joint Military Command, or SMC led by Salim Idris. Other opposition group calling for peaceful solution to the conflict is the National Coordination Committee for Democratic Changes. It consists of 13 political organization including the largest Kurdish party, Democratic Union Party PYD. The insurgency has increasingly drawn Jihadist from all over the world. Jabhat al Nasra and The Islamic state of Iraq and Al sham, Ahrar al sham, Liwa Al Sham, Suqour al-Sham and other Islamic brigades become the main power for the Syrian opposition with loyalty to Al-Qaida and a strategy to establish an Islamic state in Syria. 13 of those Islamic groups including the FSA issued a statement against the National Coalition and the SNC stated that “These forces call on military and civilian forces to unite under a clear Islamic framework based on Sharia law, which should be the sole source of legislation,” Also they stated that they do not recognize the National Coalition led by Al- Jabra and Touma. Their number increased to 30 organizations. Most of these organizations are in the north of Syria and also in Damascus. Internal fight between these groups for power is going on, in addition to their attacks against the Kurdish Nation. Turkey is giving them the support and they attack the Kurds and YPG. Walid Al Moalim said that Syria is ready to attend the Geneva 2 meeting without any conditions. The Democratic Union Party (PYD) was established in 2003, as illegal organization hundreds of its members were arrested and many of its leaders executed by the Syrian Baath regime. The party led a 2004, Kurdish uprising and about 2000 of its members were arrested. By 2011, PYD has become the largest Kurdish party and is supported by the majority of Kurds in Syria. When the Syrian uprising started there were two different strategies established by the Kurdish parties. The PYD strategic policy is to organize and protect the Kurdish people, to not take sides and to give support to the Syrian opposition if they recognize the Kurdish rights and demands. PYD with other 13 Syrian organizations established the National Coordination Committee for Democratic Change. PYD established the People’s Defense Units YPG and the People’s Council of Western Kurdistan to defend and administer Western Kurdistan. The Kurdish parties, a few of them joined the Syrian opposition and others did not follow any major policy or have any strategy to implement. President of Kurdistan, Masoud Barazani at the end of 2011, helped 16 Kurdish parties to establish the Kurdistan National Council. In July of 2012, President Barazani helped to bring both Kurdish sides, People’s Council of Western Kurdistan and the Kurdistan National Council (KNC) to work together and they established The Kurdish Supreme Council to govern and administer Western Kurdistan. The high committee consists of 10 members, five from Kurdish People’s Council of Western Kurdistan and five from KNC. On September 12th, in Qamishli city, both People’s council of West Kurdistan and KNC met and agreed to establish a local autonomy for Western Kurdistan and all 16 parties in KNC have announced their support for the autonomy. Both sides established committees to prepare for parliamentary elections in Western Kurdistan. Aldar Khalil a member of PYD and the Supreme council of Western Kurdistan stated that other minorities in the region like Arab, Assyrian, Christian and Armenian will have representatives in Western Kurdistan structure. For the year 2013, Western Kurdistan have been subjected to brutal attacks by forces belong to Jabhat Al Nasra, The Islamic State of Iraq and Al Sham, ISIS and many other Islamic brigades of FSA. They have used brutal methods, mass killings, torture, psychological warfare, These terrorist acts are aimed against the people of Western Kurdistan, Kurds, Arabs, Assyrians and Armenians. The YPG forces of more than 20,000 fighters defended Western Kurdistan and defeated the terrorist groups in all of the areas they attacked, like Siri Kani, Afrin, Jandris, Shikh Maqsood and Ashrefia in Aleppo, Kobani. Al Hasaka, Romylan, Qamishli and other areas. PYD with its wise strategy and the support of the Kurdish people of Western Kurdistan, become a major power player in the Syrian conflict. President of PYD Salih Muslim has met with the Turkish officials twice and discussed with them the situation in Western Kurdistan. Also he met with Barazani, President of Kurdistan, with Prime Minister of Iraq, Nori Al Maliki in Bagdad, met with the Iranian officials in Tehran, met with Russian officials in Moscow, met with many European officials and with Al Jabra, the President of the Syrian Coalition in Paris, France. I can see autonomy for West Kurdistan in the near future, recognized by the regional powers including Turkey, Iraq and the Syrian government of Bashar al Assad or by a new government led by the opposition. The Turkish agreement with the PKK will have a big impact on Western Kurdistan and the Kurdish Nation, but all of that depends on whether Turkey will honor this agreement or not. An autonomy for West Kurdistan will strengthen the KRG position with Turkey and Iraq. It will have a big impact on Turkish policies regarding the PKK and the Kurds. Turkey will honor this agreement or not.